If you have never had the chance to hike Hidden Canyon into Observation Point Trail, you don't know what you are missing. Next time you are planning a vacation, consider Zion National Park and its wonderful trails. Zion was Utah's first national park and was established in 1919. The park centered on Zion canyon and in the early 1920s could be accessed by car. The main attraction was the Zion national monument and lodges as well as tent camping were made available in the mid 1930s. There is also a tunnel over 5000 feet long cut directly through the cliffs of Zion so visitors can easily travel from Zion to Bryce. Today visitors not only visit the park to see Zion Canyon, they also spend time hiking the many trails throughout the park. Hidden Canyon was carved thousands of years ago by the rushing water and currently sits between Cable Mountain and Great White Throne Mountain due north of the Zion Canyon Visitor's Center. The trailhead is accessed at the Weeping Rock parking lot and the trail circles back to end where you began. If the crowds are large, you may need to park at the Canyon Junction trailhead or at the Visitor's Center. Shuttles take park guests from the Visitor's Center to the Weeping Rock parking lot and back several times per day. 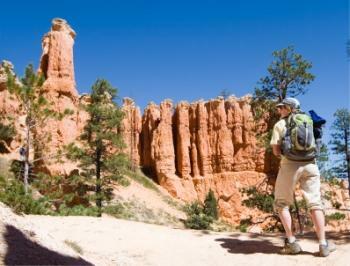 The normal Hidden Canyon hike involves a 2.2 mile loop through the canyon and back. The elevation is just over 1000 feet and is considered strenuous. The trail is maintained but steep in certain sections. There are switchbacks at the canyon entrance, and several others which cause the trail to become very narrow. There are chains along the edge of the trail but you should take precautions not to slip on the loose rocks and not get too close to the edge since many of the areas with chains have sheer drop offs as much as 100 feet. The average hiking time is approximately three to four hours with full sun along most of the trail. After returning to the trailhead at Weeping Rock, branch left to Observation Point. There will be signs along the trail to point you in the right direction. The Observation Point Trail hike is considered the most strenuous hike within Zion National Park and takes most hikers the better part of a day to complete. The 3.7 mile trail has an elevation of over 2200 feet and contains a significant number of switchbacks. An experienced hiker should be able to complete the Hidden Canyon and Observation Point Trail hikes in three and six hours respectively. Once you have taken in the views, the return trip is back through the canyon and along the East Rim with arrival at the Weeping Rock parking lot. Now that you know how to hike Hidden Canyon into Observation Point Trail, you need to determine when to go. The weather in Utah is sometimes unpredictable and many areas of Zion National Park close during the winter. Mid-spring to late-summer is the best time to make the most of the beautiful scenery in and around the park by enjoying the hiking trails.